F. Scott Fitzgerald said, "There are no second acts in American life." But, I disagree. I'm in my third act, now. Artistic act, that is. Who knows how long it will last. What I do know, is that it began eight years ago, when I started teaching my on-site drawing class in Italy. For many years, I was an primarily an illustrator, working day and night for magazines, books, advertising and more. Then I turned to still life painting as my principle work. Now, I identify myself as on-site artist. As creators, we often wonder where our work is going. We follow our inner compass, our gut, and we forge ahead. Where to? We're not quite sure. However, much can be learned by looking back at earlier works and reflecting. 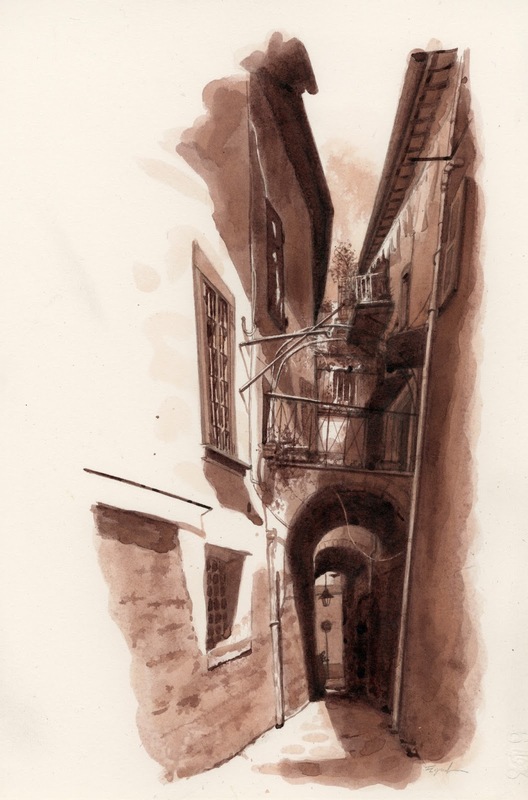 Here is an early sketch from my first teaching trip to Italy. The work is very small - made in a sketchbook with a ballpoint pen. I was moved by the light, the narrow space and the shapes. I worked quickly and finished in thirty minutes. I was pleased with the result. I felt fulfilled. I had captured something personal, and expressed it in a personal way. Looking back, it was the start of something. Last year, I returned to the same exact scene. Still excited by the place, I sat down to try to capture it a second time. Again, I drew quickly to capture the mood, the light, the sense of place. However, this time, I worked larger and stayed much longer - perhaps 2 to 2 1/2 hours. Then I continued working on the drawing later, adding multiple washes of ink. The "urban sketching" was completed onsite, but the image in my head was not. So, I continued on, to achieve a further goal, which could only be described by the image itself. Again, I was following my gut. Soon I'll head back to Italy, and again, I'll draw constantly for a month. Where is my work going? I'm not sure. It seems each year, I've added more and more detail, and more and more ink. I've worked larger and larger. But it can only go so far, I fear, before all spontaneity will be lost. I've killed drawings by overworking them, but then, I've hurt them too, by quitting too soon, and feeling later, that there was more to say but that I was a afraid of ruining things. It's all a balance, and it's different for all of us. In this act of drawing, we all wonder if there is a plot twist ahead. Meanwhile, we keep drawing, with our minds and hearts open, knowing that only time will tell what happens next.